My first ever Safari in Africa, a dream came true. "...At home, in Slovakia, I was getting all my gear ready. I flew from Vienna, Austria, through Amsterdam, to Lusaka in Zambia. The flight was 12 hours long, but I was so excited I could not even sleep.."
Visiting Africa has been my dream since I was a kid, I have spent all these years studying this beautiful country from books and magazines. Then one day, I got an invitation and immediately said YES! At home, in Slovakia, I was getting all my gear ready. I flew from Vienna, Austria, through Amsterdam, to Lusaka in Zambia. The flight was 12 hours long, but I was so excited I could not even sleep. When I landed in Zambia, I was expecting somebody with a sign showing my name. But soon I realised nobody was waiting for me at the airport at that time at night, and that was when my African adventure started. No cell phone reception or internet, so I had to sit on my big bag and think of my next move. I ended up at the police station contacting my friend Don, who was supposed to arrive the next day. The organiser came to see me at the hotel the following day and apologised for the mistake. Driving to the hunting area, made me realise how far from civilisation we were going to be hunting. The driver told us, to buy the last stuff we needed because we there was not going to be a second chance. After that, we drove for another 3 hours. We arrived at the ramp. No fence, just a road closed to public vehicles. The area is called Mushingashi, and it is situated near the Kafue river, next to the Kafue National Park. It was another hour to get to the camp, which was right next to the river. In the evening we were chatting with our guide Adam about the buffalo stories while chewing on biltong. The first morning, I woke up to an unusual sound. It was hippos, and the sound was pleasant because it reminded me I was waking up in the wilderness. In the 4x4, I sat next to Adam to ask him about every animal. Every time I saw a wild animal, I was so surprised I could not hide the excitement. One of the most exciting moments was when one morning an elephant charged the truck. I freaked out, and Adam said, the bull is just bluffing. I’m not used to such big creatures; they do not exist in Slovakia. My first kill happened on our first day. I was so excited! I was on the porch of our little house on the river bank. I could see crocodiles and hippos on the other side. Suddenly, as I looked to the left, on our side of the river, there was bushbuck! I ran into the house waking up Don, shouting: Bushbuck! 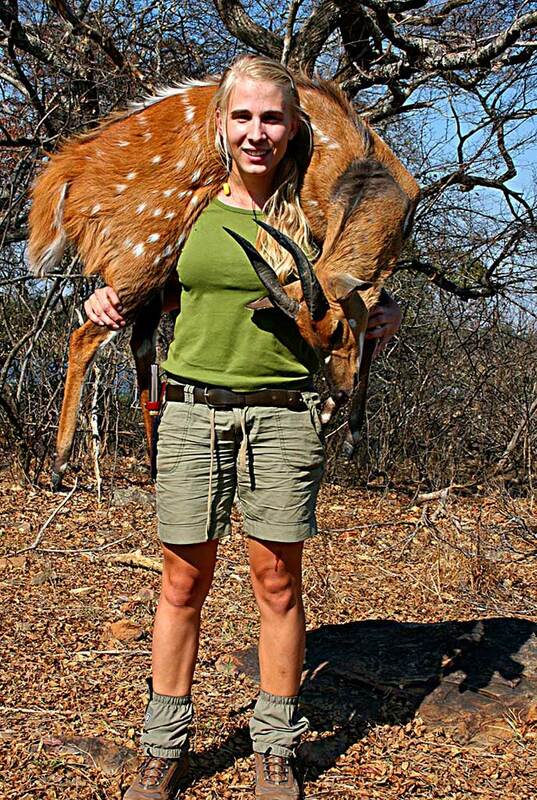 Bushbuck! Bushbuck! After I went back outside, the bushbuck disappeared. So we stood at the edge of our camp, and I was handed a rifle. “It’s your turn!” they all said to me. So we headed to the nearest bush, to hide, and that is when I thought, that it had been a long time since I shot my first boar, so I said to myself: "I hope I will take a good shot when I get a chance to". We stayed still until we saw the beautiful fur of the Chobe bushbuck behind the branches. I was very nervous about taking the shot, as I could not see clearly the horns, but when I finally did, I took my shot. Adam's look gave me certainty; the shot was placed right. The trackers wanted to take my kill and drag it away. I felt like it was wrong. I wanted to celebrate my first kill in Africa by taking it to the truck myself. MY Chobe bushbuck. However, buffalos were our main focus every morning. We were driving all over the area, looking for fresh signs of the presence of this magnificent creature. 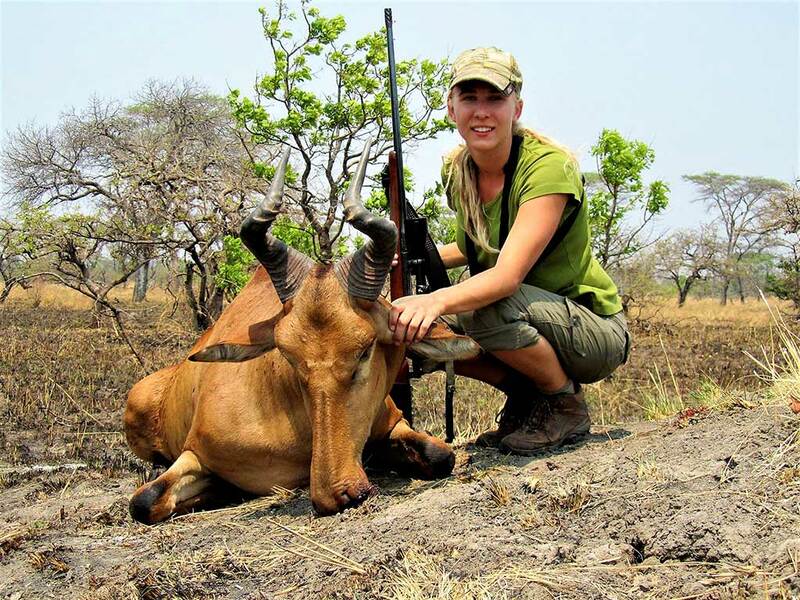 After checking the area, we trailed a different animal, the Lichtenstein's hartebeest. Hartebeests are hard to stalk. It is a very spooky animal. It took us a while to get lucky and get a chance to pick up a rifle. I was on the sticks for a longer time, trying to get steady and getting my adrenaline under control. Obviously, hartebeest was the biggest animal I has ever seen. After calming down, I pulled the trigger. The Hartebeest ran a couple of yards, so I reloaded, wanting to shoot again; however Adam said not to shoot again. The shot was exactly where it was supposed to be. He was right because then the beast fell on the floor. By now, I know what it means to have a hunting fewer. I get it every time; I’m after a game. Recently I’ve learned to manage it, but as soon as I shoot, I get the shivers.I hope you liked my story.